Retired NHL legend Kirk McLean couldn’t save himself in the kitchen. He told me so himself. But this doesn’t mean he’s a stranger to good food. In fact, he’s got excellent taste. And his new favorite spot happens to be the upstairs, wooden-beamed bar of his own new restaurant, McLean’s. Located at 322 Water Street, a stone’s throw away from The Old Spaghetti Factory, travellers now have a hope of stumbling upon quality food when sent to Gastown in search of the dated tourist trap. 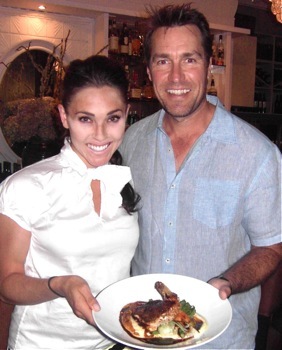 One of Kirk’s favorite McLean’s menu items is juicy Free Range Chicken Breast, which I agreed was one of the best selections from his menu (created by Chef Eddie Szasz), featuring Pacific Northwest cuisine. Vancouver’s food media attended the introductory soiree, which began with large carafes of sangria. 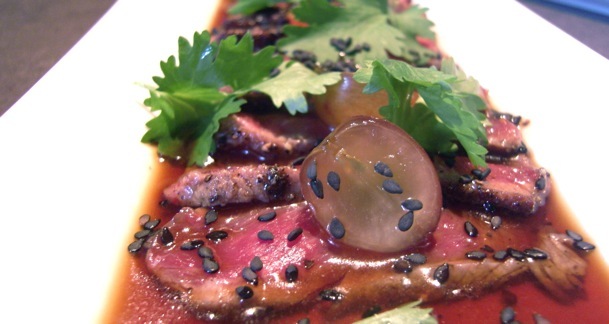 We were invited to test everything on the largely carnivorous menu. For those of you on a liquid diet, indulge in a Toblerone martini or fresh-squeezed watermelon juice with Brut Rose Cava and lime. Onto the solid main courses – here’s the AAA Beef Tenderloin & Tiger Prawns with caramelized onion potato gratin, asparagus, and grape tomatos, finished with a demi glace. This plate is stacked like Captain Kirk’s pads during the save. Even Robert Reichel and his Calgary Flames would enjoy its richness. Next time you’re craving a hearty meal bearing your all-time favorite goalie’s stamp of approval, head to McLean’s in Gastown. Also, look for an FMA Entertainment Weekly segment with Kirk and I in the kitchen coming soon. Thanks to Kirk, his staff, and Cassandra Anderton for organizing the glorious night of feasting.